A statement by the senate spokesman, Enyinaya Abaribe, said the senate particularly condemned Sunday’s violence which resulted in injuries on a serving Senator, Magnus Abe. Senator Abaribe stated that the Senate was disturbed that what should have been a peaceful gathering turned violent resulting in injuries. The Senate asked the Inspector General of Police, Mohammed Abubakar, to investigate the latest incident and ensure that it would not recur. It advised politicians and their supporters to exercise greater restraint and avoid acts that would not only overheat the system but may harm the country’s democracy. The Police in Rivers State at about 5.30am on Sunday morning stormed the Rivers State College of Arts and Science in Rumuola, venue of the proposed Save Rivers Movement (rally) scheduled to hold at 1:00pm. The Ikwere Road DPO and other officials of the Nigerian Police dismantled all the canopies and stage for the event, scaring off the youths who were helping in getting things ready for the rally. 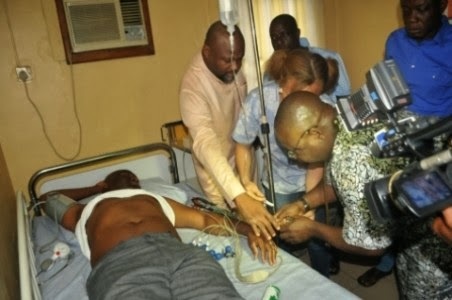 During the operation, a Rivers State Senator, Magnus Abe, was shot at close range, resulting in serious injuries. The Senator, representing Rivers Central Senatorial District, had on Sunday gone to the venue of the proposed ‘Save Rivers Movement’ rally where he was shot at. He was said to have been among the several people that were injured after the Police scared off those taking part in the rally with tear gas and rubber bullets.